2019 Event Tickets for Des Moines Concerts are on sale now! Many families love to enjoy outdoor festivals together because there is something to entertain everyone in the family, between music, games, food, and more. The summer months are a great time of year for families to take advantage of these inclusive events. For example, at the Plaza in Altoona, Friday nights from 6 p.m. to 9 p.m. bring the community together with a rotating list of bands, with food and drinks available upon purchase. Just bring some lawn chairs or blankets and take in the tunes. The Ankeny Summer Sounds Concert Series follows a similar format, pulling together community bands and local acts such as the Ankeny Community Chorus and Band, The Sheet, Standing Hampton, and Richie Lee. On various days, food trucks coordinate with local musicians at events such as Fridays in Clive, during which local food trucks offer food in the Campbell Recreational Area from 5:30 p.m. to 8:00 p.m. while musicians perform to entertain foodies. Last summer’s performers included Brian Congdon, Damon Dotson, Josh Sinclair, Brad Seidenfeld, Dustin Baird, and SUEDE. For Concerts in Des Moines, please see our event listing calendar of Concert tour dates in 2019! Whether listeners want a crowd of 50, 500, or 2,700, or 5,000, Des Moines has it covered. The venue line up in Des Moines is not homogeneous. For smaller venues, explore Mars Café, Arthaus, Gatherings, Green Grounds Café, Gilbert Street Piano Lounge, Riverside Theatre, Lime Lounge, The Gas Lamp, The Underground, Vaudeville Mews, Ritual Café, Hull Avenue Tavern, Mickey’s Irish Pub, Purgatory’s Pub, The Gardens, Coffee Cat, Ruby’s Pub, The Bank, Riverboat Lounge, The Phoenix, The Galery Lounge, Tailgators, Redstone Room, or Shuey’s Restaurant & Lounge. For mid-sized venues, visit Adler Theatre, Bell Tower Theater, Bridge View Center, Hoyt Sherman Place, Englert Theatre, Gabe’s Inc., Wooly’s, Rusty Nail, Capones Restaurant, Lake Avenue Lounge, or Mooney Hallow Barn. For larger venues, find Bash On The Farm, or Val Air Ballroom. 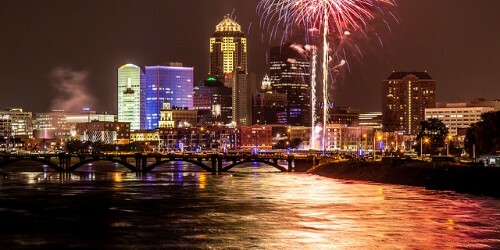 Although many people do not consider Midwestern states international influencers, cities such as Des Moines prove that humble Midwestern cities and town have a profound reach. Take the 80/35 Music Festival as an example. This short, two-day progressive indie music celebration hosts 50 acts spanning national, regional, and local levels. This festival has been going on for over a decade, last year in Western Gateway Park. 30,000 people from around the world attend annually. Similarly, the Des Moines Arts Festival speaks to this city’s international impact on the arts. Sine 1958, it has evolved from an Iowa-only art fair. How Do I Find Upcoming Des Moines, Iowa Concert Events Near Me? See below for a list of Concerts in Des Moines IA scheduled for 2019.